A Natural Horsemanship Universal String Training Line. 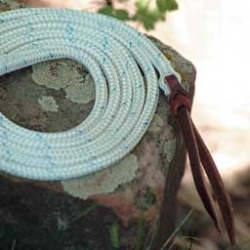 A Parelli Style 1.8m / 6ft Universal String Made from Strong Rope Identical to the Halter. Leather Popper at one End and a Loop at the other. The Universal String is Ideal for Various Applications During Natural Horsemanship / Parelli Training. Designed to tie on the end of the Communication / Carrot Stick - extends it by 12ft! Natural Horsemanship String - Made from the Finest Quality Materials but Affordable!